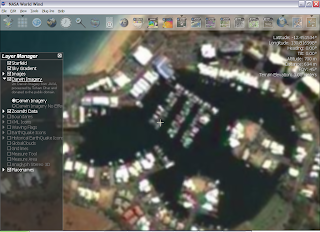 Finally overcame all my prejudice and added the Google Geographic Search to the World Wind PlaceFinder via the REST API. 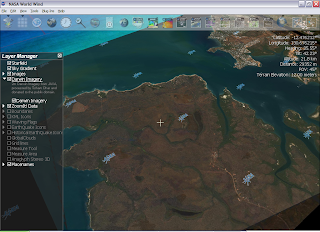 It is all quite nice and simple to interface and highlights the theme of World Wind as a geographic data browser, to stand shoulder to shoulder with all the html-browsers like Firefox, Opera, Safari and oh-so-notorious Internet Explorer. In the same spirit it should offer equal footing for all the major players to have a presence, we don't think twice about having MSDN, Yahoo Movies and Google Search open in tabs next to each other. An independent geographic browser should offer similar visibility and democracy to those willing to publish data in an understandable format. 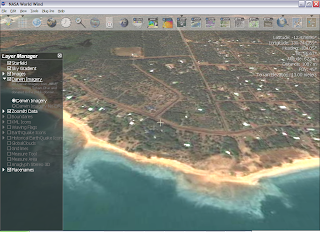 FlashEarth and OpenLayers demonstrate this bringing together with the imagery as well as the search API, but I guess World Wind will never be able to publicly do the same due to legal wrangles. A geographic browser should allow server side(image servers/feature search/routing/traffic) applications as well as client side extensions(scripts/plugins/xml layers/movie making) and World Wind to most extent fits the bill. The .NET version is the Firefox of the geobrowsers, with all features thrown in but left open to change(or is it SeaMonkey), while the Java version is Gecko, a barebones multi-platform geographic data rendering engine that you can drop in where you wish. Incomplete entry - Try calif instead of California , Google reads your mind and delivers. Different address format - 182 Murray Street, Tanunda S.A. 5352 ends up in USA in VE but in the place I wanted in Google (possibly because they are tracking my IP, time to get paranoid later). Post Office accuracy - Google consistently located post offices when supplied just town names, where as Virtual Earth picked a random spot in the town. Not that I am biased , just do your own tests and see which placefinder gets you what you want, another excuse to try new World Wind where you can find them all side by side. Digital Globe is now in a strong position with a successful launch of a functional new high-resolution satellite. Google has got some unwarranted free publicity out of it as well. This has led to some market positioning and jostling between the two entities , with Digital Globe trying to push their new acquisition GlobeExplorer as a direct imagery access service. Everything seems to be resolved now, but Digital Globe seems keen to get back to their tried and tested money from imagery sales business model, this time peddling access to global mosaic with a few extra ribbons such as online processing instead of individual QuickBird Scenes. The heavily watermarked public WMS works cleanly with World Wind for those pining for QuickBird data, albeit a bit slowly ( we are thinking of putting a tile-cache in front of it). Here is what it has to offer over Sydney. Another occasion to suit up and flash the red-tie - Engineers Australia Annual Awards Dinner. It was quite fun with acrobats from Cirque du Soleil and comedian waiters. I renewed my acquaintance with a few friends I had met last year at the dinner ( I must be a hermit , I meet people once per year). Then the rest of the night was spent dancing Swing and variations at Boho. Turned out to be quite fun after all. I am considering doing a PhD on L-Band Polinsar . There is quite a bit of groundwork now in this field with the repeat pass systems from DLR E-SAR and ALOS-PALSAR. I have worked with data from both of these sensors in the past and doing a PhD will be natural continuation. On the other hand there are disadvantages of doing a PhD too early in the career without an explicit academic bent, or even worse a PhD constrained by commercial interests( not that anything in life is ever unencumbered by it). If anyone wants to offer me any free advice to help me make up my mind feel free to do so. The big news today in satellite imaging circles is the launch of WorldView-1. The launch videos are on the Boeing site. The not so cognizant seem surprised that WorldView-1 is a panchromatic only sensor. Panchromatic captures greater energy due to the broad filter and uses it to produce higher resolution. WorldView-1 probably had a MultiSpectral sensor as well which is rumored to have suffered some sort of accident during the build and was not replaced due to time and budget constraints. Hollywood was still popular in the black and white days as long as the actors did their job and there was a reasonable plot. I have little doubt about the popularity of WorldView-1, the quality of the colour products will depend on the orbital match with Quickbird and that will become clearer once the TLE's are published and both of the satellites are being tracked. Using pixel shader 2.0 more complex operations can be performed on World Wind texture tiles. The spectral contrast stretch operations involve converting from RGB to HSI space and adjusting the intensity with a multiplier and offset, then converting back to RGB. This involves a quite long and complex pixel shader. The results are shown here. Spatial enhancements such as blur,sharpen or any other convolution oriented operations involve look up using texture coordinates and are dependent on texture size. I have implemented blur and sharpen, hopefully arbitrary 3x3 convolutions soon with parameterization of the matrix. Notice how the jpeg artifacts are affected by sharpen and blur. After a brief foray into GLSL shaders and suffering a beat back from the not so good GL support on my laptop graphics card I went back to HLSL and .NET World Wind hoping to implement some simple image processing via pixel shaders and expose the shader parameters via the QuadtileSet properties GUI, much like in NVIDIA FxComposer. 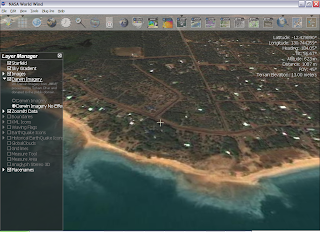 It must be noted that with little hard drive space limits and high bandwidth it is possible to have full-resolution imagery in World Wind as zipped dds, png or even tiff tiles. These can then be processed via a pixel shader to perform a range of enhancements. Spatial operations such as sharpen, blur or unsharp-mask will require reverse texture coordinate lookup and Pixel Shader Model 2.0, but a lot of high speed in your graphics card enhancement of imagery is possible. I tested out an old shader from Stephan demonstrating multitexturing and started on one for dynamic some brightness-contrast enhancements on a per imagery layer basis.